There’s something weirdly addicting about watching an untouched piece of tech being unboxed for the first time. And it’s a great way to see brand new tech in pristine glory. But a new YouTube video by well-known tech vloggers Marques Brownlee (MKBHD) and Justine Ezarik (iJustine) is a bit different. While the device they unbox is untouched, it’s not technically brand new. In fact, it’s over 18 years old. The video, posted to iJustine’s channel, shows the two excitedly unboxing a pristine Apple iBook G3 laptop (a device that was released in 2000). If it were a person, it’d be old enough to vote. Some of you may not even know what an iBook is. It’s, for all intents and purposes, a distant predecessor of the modern MacBook Pro. But aside from the prominent Apple logo, it can be a bit tough to tell. The iBook G3 is clad in an all-plastic design with a white aesthetic and some bright and bold colors. It’s a bit clunky looking when compared to the sleek metallic form factor of modern Apple notebooks. But it still sports a signature Apple design, in its own way. Specification-wise, the differences become even more apparent. The iBook G3 sported a 300 MHz CPU, 64-megabytes of RAM, and a 6-gigabyte hard drive. While top-of-the-line when they were released, those are pretty amusing specs by today’s standards. Charmingly, the iBook G3’s Mac OS 9 operating system even contained a full-fledged tutorial on using the internet — something that was relatively new among consumers 18 years ago. Interestingly, the iBook’s primary internet browser was Microsoft’s Internet Explorer. 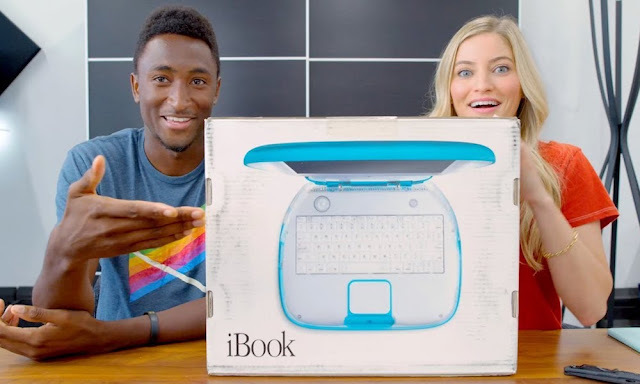 Whether you remember using an iBook G3 way back in 2000, or you just want to revisit some old school Apple nostalgia, iJustine’s video is worth a watch.